A key thing to remember when looking at this data is that most of the people in the cath lab at a given moment are not actually having a heart attack — just 13 percent are. (Abstract/poster available upon request). However, thereâ€™s enough suspicion or history of heart disease for doctors to take a look inside; most of them have hypertension and coronary artery disease, and many have had a heart attack in the past. The group is mostly men, average age 63. While people with a college education were found to overall have better survival, the difference specifically in those who have had a heart attack was larger: people who did not have a college education had substantially higher mortality after a heart attack. 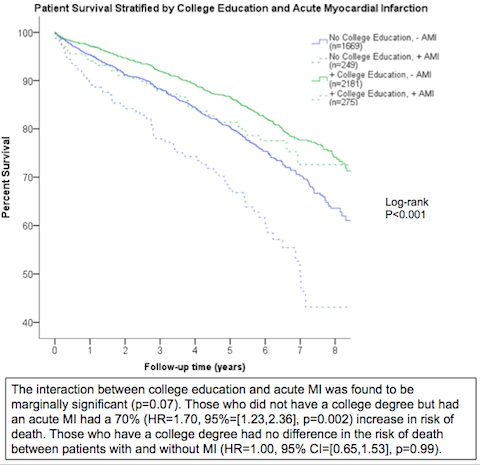 The survival of people with a college education was not significantly impacted after a heart attack. Differences in survival seen in people with varying educational backgrounds have been mostly attributed to differences in heart disease risk factors and income. In this study, even when the researchers accounted for traditional heart disease risk factors, severity of coronary artery disease, demographics, insurance status and access to health care, lack of college education was still associated with a more than 50 percent increase in the risk of death. Surviving a heart attack entails major lifestyle changes that need to occur practically overnight, Hayek emails us. The researchers speculate that â€œcollege education may impart better understanding of the clinical condition, leading to improved compliance with medication regimen and lifestyle changes.â€ However, they cite lack of explicit financial information as a limitation. Tons of research shows a relationship between mortality and education in general, but the challenge is to dissect education away from income, and the accumulated effects of behavior before the heart attack from behavior after. Other researchers (see this study from Denmark) have come to similar conclusions about educationâ€™s independent effects.